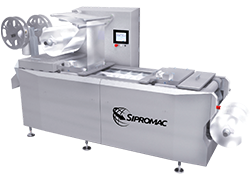 Sipromac has three models of automatic thermoformers. Film thickness varies from 320 to 641 mm to meet your production needs. A number of basic and optional features are offered for Sipromac thermoformers to accommodate a wide range of products. Sipromac can also build customized thermoformers to meet your specific needs. The heavy-duty stainless steel single-piece frame carries a lifetime guarantee. The machine’s intuitive interface combined with an ergonomic design allows for easy loading and simple operation. The system’s components are corrosion-proof and their design allows for simple and easy maintenance in order to meet the strictest hygiene standards. Click on the link below to see the advantages of using a thermoformer in the food sector.